Well movie watching is something I enjoy but not to the extent where I am watching everything and anything that comes to the nearby multiplex. I am very choosy about what I watch for I believe in these words by Audrey Hepburn a lot. 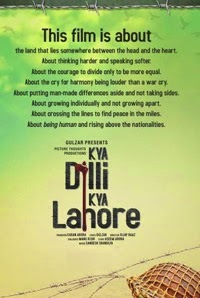 This weekend I decided to catch up with Kya Dilli Kya Lahore (wondering WHY? Read my post here on it) and added yet another lesson to my book of life. If there is one thing that stared back at me throughout the movie was just one thought – wish the answer to this problem could be as simple as we are so similar yet so different as rightly pointed out by a wonderful fellow blogger Beloo Mehra on my previous post. The movie made me cry at some places while at some it made me laugh. But overall it made me think, what is that gives me goose bumps in a tale of two countries separated at birth never to be united ever again? Perhaps I would never be able to explain. Just the way I would never be able to express why should one watch this movie? The story line begins on a very mixed note as a Pakistani soldier of Indian origin and an Indian soldier of a Pakistani origin meet. The exchange between them (it was more than just words) is what sets the tone for this whole movie. 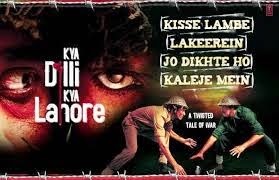 The simplicity of the tale is where the real beauty lies of this movie which is sprinkled with amazing poetry by Gulzar adding to its grandeur. The location of the movie might be far away from the place of origin but the story is as close as possible to the reality. The end is the show stealer. It left me with a zillion questions; I am still trying to look for answers. to know the beauty behind this sad tale of separation. It will tug your heart. not for the joy it would bring along, but watch it to learn how to celebrate the differences and yet be happy. to know how love is trying hard to triumph peeping through those crevices and yet is unable to be victorious. to know that there are more than just differences between us which are responsible for the way things are. to hear the untold saga that every heart wants to hear. Now I want to see this movie for sure! There is something about when we can't explain why to watch a movie...it actually makes it all the more watch-able. Don't you think so? Maybe it is how the movies makes us feel, or how a story is told that seems so authentic and near, and yet so faraway like a story often can be...Thanks for this review. I will of course have to wait till it comes out on DVD or is available in other ways, because they won't be showing this one on any cinema nearby in my southern town. Oh... is that so? I wish you were here... we could have gone together. Am sure we would have enjoyed for some of our common loves - Gulzar, partition and ofcourse good movies!